Join Julie Fei-Fan Balzer and Jenn Mason with their best bookmaking and art journaling techniques from The Mixed-Media Workshop Series 100. Distressing Markers: Three ways to use Distress Markers including turning them into airbrushes. Awl for You! Use your awl for bookmaking and more, even hanging artwork! Alcohol Pen: Discover how to fill alcohol pens to create custom colors, and use them on more than paper. 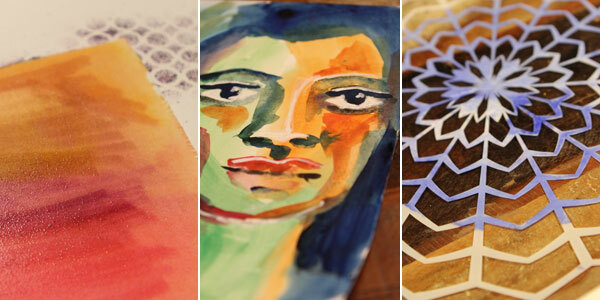 Tube Time: Learn new ways to mix and incorporate tube watercolors. Sketchbook Interchange: Create a nifty book with removable pages that you can continue to swap and refill. Printing in Your Journal: Make multi-layered prints to create unique art journaling pages. ICE Resin Pages: Create sturdy and beautiful pages for a bookmaking project with ICE Resin®. Order or download your copy of Season 100: Best of Art Journaling & Bookmaking today!